The OSGi programming model is based on the collaboration of standard and custom components. In such a model there is no central authority that has global knowledge of the complete application. Though this lack of authority can significantly increase reusability (and robustness) there are times when the activities of the collaborators must be coordinated. For example, a service that is repeatedly called in a task could optimize performance by caching intermediate results until it knew the task was ended. To know when a task involving multiple collaborators has ended is the primary purpose of the Coordinator service specification. The Coordinator service provides a rendezvous for an initiator to create a Coordination where collaborators can decide to participate. When the Coordination has ended, all participants are informed. This Coordinator service provides an explicit Coordination model, the Coordination is explicitly passed as a parameter, and an implicit model where the Coordination is associated with the current thread. Implicit Coordinations can be nested. Coordinators share the coordination aspects of the resource model of transactions. However, the model is much lighter-weight because it does not support any of the ACID properties. Coordination - Provide a solution to allow multiple collaborators to coordinate the outcome of a task initiated by an initiator. Initiator - An initiator must be able to initiate a coordination and control the final outcome. Participants - Participants in the task must be informed when the coordination has ended or failed as well as being able to terminate the Coordination. Time-out - A Coordination should fail after a given time-out. Blocking - Provide support for blocking and serializing access to Participants. Nesting - It must be possible to nest Coordinations. Per Thread Model - Provide a per-thread current Coordination model. Coordinator - A service that can create and enumerate Coordinations. Coordination - Represents the ongoing Coordination. Initiator - The party that initiates a Coordination. Participant - A party that wants to be informed of the outcome of a Coordination. Collaborator - Either a participant or initiator. This section is an introduction in the usage of the Coordinator service. It is not the formal specification, the normative part starts at Coordinator Service. This section leaves out some of the details for clarity. Each Coordination has an initiator that creates the Coordination object through the Coordinator service. The initiator can then push this object on a thread-local stack to make it an implicit Coordination or it can pass this object around as a parameter for explicit Coordinations. Collaborators can then use the current Coordination on the stack or get it from a parameter. Whenever a bundle wants to participate in the Coordination it adds itself to the Coordination as a participant. If necessary, a collaborator can initiate a new Coordination, which could be a nested Coordination for implicit Coordinations. A Coordination must be terminated. Termination is either a normal end when the initiator calls the end method or it is failed when the fail method is called. A Coordination can be failed by any of the collaborators. A Coordination can also fail independently due to a time-out or when the initiator releases its Coordinator service. All participants in the Coordination are informed in reverse participation order about the outcome in a callback for ended or failed Coordinations. A typical action diagram with a successful outcome is depicted in Figure 130.2. If the doWork method throws an Exception then the template fails with a Coordination Exception because it is failed in the try block. Any exceptions thrown in the try block are automatically causing the Coordination to fail. The Coordination is always terminated and removed from the stack due to the finally block. All failure paths, Coordinations that are failed by any of the collaborators, time-outs, or other problems are handled by the end method in the finally block. It will throw a FAILED or PARTIALLY_ENDED Coordination Exception for any of the failures. The different failure paths and their handling is pictured in Figure 130.3. The example shows an explicit Coordination because the create method is used, implicit Coordinations are used in Implicit Coordinations. The parameters of the create method are the name of the Coordination and its time-out. The name is used for informational purposes as well as security. For security reasons, the name must follow the same syntax as the Bundle Symbolic Name. In a secure environment the name can be used to limit Coordinations to a limited set of bundles. For example, a set of bundles signed by a specific signer can use names like com.acme. * that are denied to all other bundles. The zero time-out specifies that the Coordination will not have a time-out. Otherwise it must be a positive long, indicating the number of milliseconds the Coordination may take. However, implementations should have a configurable time-out to ensure that the system remains alive. The Coordinator provides the guarantee that this code will always call the doFinish method when the Coordination succeeds and doFailed method when it failed. The Participant must be aware that the ended(Coordination) and failed(Coordination) methods can be called on any thread. If the doWork method throws an exception it will end up in the catch block of the initiator. The catch block will then fail the Coordination by calling the fail method with the given exception. If the Coordination was already terminated because something else already had failed it then the method call is ignored, only the first fail is used, later fails are ignored. In all cases, the finally block is executed last. The finally block ends the Coordination. If this coordination was failed then it will throw a Coordination Exception detailing the reason of the failure. Otherwise it will terminate it and notify all the participants. The Coordination Exception is a Runtime Exception making it unnecessary to declare it. Explicit Coordinations allow the Coordination objects to be passed to many different collaborators who can perform the work on different threads. Each collaborator can fail the Coordination at any moment in time or the time-out can occur on yet another thread. Participants must therefore be aware that the callbacks ended and failed can happen on any thread. The following example shows a typical case where a task is parallelized. If any thread fails the Coordination, all other threads could be notified before they're finished. The Coordination object is thread safe so it can be freely passed around. See also Figure 130.3. However, in this case the finally block with the call to the end method is even more important. With an implicit Coordination the Coordination is put on a thread local stack in the begin method and must therefore be popped when the Coordination is finished. The finally block ensures therefore the proper cleanup of this thread local stack. The difference between implicit and explicit Coordinations is that the implicit Coordination is not passed as a parameter, instead, collaborators use the current Coordination. With implicit Coordinations all method invocations in a thread can always access the current Coordination, even if they have many intermediates on the stack. The implicit model allows a collaborator many levels down the stack to detect a current Coordination and register itself without the need to modify all intermediate methods to contain a Coordination parameter. The explicit model has the advantage of explicitness but requires all APIs to be modified to hold the parameter. This model does not support passing the parameter through layers that are not aware of the Coordination. For example, OSGi services in general do not have a Coordination parameter in their methods making the use of explicit Coordinations impossible. Collaborators can act differently in the presence of a current Coordination. For example, a collaborator can optimize its work flow depending on the presence of a current Coordination. Though the code looks very similar for the implicit and explicit Coordinations there are some additional rules for implicit Coordinations. The end method must be called on the same thread as the begin method, trying to end it on another thread results in a WRONG_THREAD Coordination Exception being thrown. Even though the end method must be called on the initiating thread, the callbacks to the Participants can be done on any thread as the specification allows the Coordinator to use multiple threads for all callbacks. The Coordination is a best effort mechanism to coordinate, not a transaction model with integrity guarantees. This means that users of the Coordinator service must understand that there are cases where a Coordination ends in limbo. This happens when one of the Participants throws an Exception in the ended callback. This is similar to a transactional resource manager failing to commit in a 2-phase commit after it has voted yes in the prepare phase; a problem that is the cause of much of the complexity of a transaction manager. The Coordinator is limited to use cases that do not require full ACID properties and can therefore be much simpler. However, users of the Coordinator service must be aware of this limitation. If a Participant throws an exception in the ended method, the end method that terminated the Coordination must throw a PARTIALLY_ENDED Coordination Exception. It is then up to the initiator to correct the situations. In most cases, this means allowing the exception to be re-thrown and handle the failure at the top level. Handling in those cases usually implies logging and continuing. The following code shows how the PARTIALLY_ENDED case can be handled more explicitly. To participate in a Coordination and receive callbacks a collaborator must add a Participant object to the Coordination. The addParticipant(Participant) method blocks if the given Participant object is already used in another Coordination. This blocking facility can be used to implement a number of simple locking schemes that can simplify maintaining state in a concurrent environment. Any collaborator can fail an ongoing Coordination by calling the fail(Throwable) method, the Throwable parameter must not be null. When the Coordination has already terminated then this is a no-op. The Coordinator service has a convenience method that fails the current Coordination if present. The fail methods return a boolean that is true when the method call causes the termination of the Coordination, in all other cases it is false. Failing a Coordination will immediately perform the callbacks and reject any additional Participants by throwing an ALREADY_ENDED Coordination Exception. The asynchronous nature of the fail method implies that it is possible to have been called even before the addParticipant(Participant) method has returned. Anybody that has the Coordination object can check the failed state with the getFailure() method. In general, the best and most robust strategy to handle failures is to throw an Exception from the collaborator, allowing the initiator to catch the exception and properly fail the Coordination. Applications should not rely on the exact time-out of the Coordination and only use it as a safety function against deadlocks and hanging collaborators. A Participant is likely to have to maintain state that is particular for the collaboration. This state is usually needed in the ended method to properly finalize the work. In general, the best place to store this state is in the Participant object itself, inner classes and final variables are a good technique for storing the state. However, the state can also be stored in a Coordination variable. Each Coordination has a private set of variables that can be obtained with the getVariables() method. 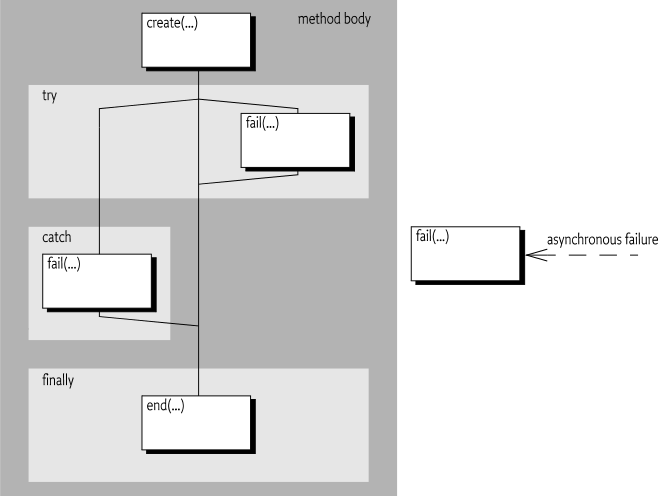 The resulting map takes a class as the key and returns an Object. The map is not synchronized, any changes to the map must be synchronized on the returned Map object to ensure the visibility of the changes to other threads. The class used for the key is not related to the returned type, it is a Class object to provide a convenient namespace. The following example shows how the state can be stored with variables. The user must be passed to the Charge service. Each method that has a charge will call the Charge service. The following code shows an implementation of this Charge service. This example allows bundles signed by ACME to perform all Coordination actions on Coordinations created by bundles signed by ACME. If a bundle is not signed by ACME it will be denied the use of Coordination names starting with com.acme. though it will be allowed to use any other name. This effectively enables only bundles signed by ACME to create Coordinations with this name prefix. A Coordination object is created by an initiator. An initiator can create a Coordination object with the Coordinator create(String,long) or begin(String,long) method. Each Coordination when created gets a positive long identity that is available with getId(). Ids are a unique identifier for a specific Coordinator service. The id is always increasing, that is, a Coordination with a higher id is created later. Passing a name that does not conform to this syntax must throw an Illegal Argument Exception. There are no constraints on duplicates, multiple different Coordinations can use the same name. The name of the Coordination is available with the getName() method. The Coordination object can be passed to collaborators as a parameter in a method call. Some of these collaborators might be interested in participating in the given Coordination, they can achieve this by adding a Participant object to the Coordination. A Participant is a collaborator that requires a callback after the Coordination has been terminated, either when it ended or when it failed. To participate, it must add a Participant object to a Coordination with the addParticipant(Participant) method on Coordination. This method throws an ALREADY_ENDED or FAILED Coordination Exception when the Coordination has been terminated. Not in any Coordination - Add it to the given Coordination and return. In target Coordination - Ignore, participant is already present. A Participant can participate in the same Coordination multiple times by calling addParticipant(Participant) but will only be called back once when the Coordination is terminated. Its order must be defined by the first addition. In another Coordination - Lock until after the other Coordination has notified all the Participants. Implementations can detect deadlocks in certain cases and throw a Coordination Exception if a dead lock exist, otherwise the deadlock is solved when the Coordination times out. Verifying if a Participant object is already in another Coordination must use identity and not equality. end() - A normal end. All participants that were added before the end call are called back on their ended(Coordination) method. TIMEOUT - If the Coordination times out the Coordination is failed with the TIMEOUT exception instance in Coordination. RELEASED - If the Coordinator that created the Coordination was unget, all Coordinations created by it will fail with the RELEASED exception. The state diagram for the Coordination is pictured in Figure 130.4. The Coordinator supports two very different models of usage: explicit and implicit. The explicit model is when a Coordination is created and passed around as a parameter. The second model is the implicit model where the Coordinator maintains a thread local stack of Coordinations. Any collaborator can then decide to use the top of the stack as the current Coordination. The peek() method provides access to the current Coordination. Once a Coordination is pushed on a stack it is from that moment on associated with the current thread. A Coordination can only be pushed once, the ALREADY_PUSHED Coordination Exception must be thrown when the Coordination is already associated with one of the thread local stacks maintained by the Coordinator service. The Coordination is removed from the stack in the end() method. The end() method must not only terminate itself but it must also terminate all nested Coordinations. The current Coordination can also be explicitly removed with the Coordinator pop() method. A Coordination that is pushed on a thread local stack returns the associated thread on the getThread() method. This method returns null for Coordinations not on any stack, that is, explicit Coordinations. Both the end() and fail(Throwable) methods terminate the Coordination if it was not already terminated. Termination is atomic, only the end or the fail method can terminate the Coordination. Though this happens on different threads, a Coordination can never both end and fail from any perspective. That is, if a fail races with end then only one of them can win and the other provides the feedback that the Coordination was already terminated. The end() method should always be called at the end of a Coordination to ensure proper termination, notification, and cleanup. The end method throws a FAILED or PARTIALLY_ENDED Coordination Exception if the Coordination was failed before. If the Coordination had already been ended before then this is a programming error and an ALREADY_ENDED Configuration Exception is thrown. The end() method should never be called twice on the same Coordination. If the termination succeeds then the participants must be notified by calling the ended(Coordination) method on each Participant that had been successfully added to the Coordination. This callback can take place on any thread but must be in reverse order of adding. That is, the last added Participant is called back first. Participants must never make any assumptions about the current Coordination in the callback. The Coordination it was added to is therefore given as an explicit parameter in the ended(Coordination) method. If a Participant throws an Exception then this must not prevent the calling of the remaining participants. The Exception should be logged. If a Participant has thrown an Exception then the end() method must throw a PARTIALLY_ENDED Coordination Exception after the last Participant has returned from its callback, otherwise the method returns normally. Participants should normally not throw Exceptions in their callbacks. If the Coordination is implicit (it is pushed on a stack) then the Coordination must be removed from its stack after the participants have been called back. This requires that the ending thread is the same as the thread of the Coordination. The end thread is the thread of the end() method call. If the Coordination's thread is not the same as the ending thread then a WRONG_THREAD Coordination Exception is thrown. If the ending Coordination is on the stack but it is not the current Coordination then each nested Coordination must be ended before the current Coordination, see Nesting Implicit Coordinations for more information. The fail(Throwable) method must not remove the current Coordination, it must remain on the stack. The initiator must always call the end() method. Always calling end() in a finally block is therefore paramount. Failing can happen asynchronously during the time a Coordination is active. A Coordination is failed by calling fail(Throwable). The Throwable argument must not be null, it is the cause of the failure. Failing a Coordination must first terminate it. If the Coordination was already terminated the fail(Throwable) method has no effect. Otherwise, it must callback all its added Participants on the failed(Coordination) callback method. Exceptions thrown from this method should be logged and further ignored. The callback can occur on any thread, including the caller's. Implicit Coordinations must not be popped from its stack in a fail nor is it necessary to call the fail method from any particular thread. The removal of the Coordination from the stack must happen in the end method. There are two asynchronous events that can also fail the Coordination. If the Coordination times out, it will be treated as a fail( TIMEOUT ) and if the Coordinator is ungotten with active Coordinations then each of those Coordinations must fail as if fail( RELEASED ) is called. A Coordination can also be orphaned. An orphaned Coordination has no longer any outside references. This means that the Coordination can no longer be ended or failed. Such Coordinations must fail with an ORPHANED Exception. Implicit Coordinations can be nested. For this reason, the Coordinator maintains a thread local stack of Coordinations where the top, accessible with the peek() method, is the current Coordination. Each time a new Coordination is begun with the begin(String,long) method, the current Coordination is replaced with the newly created Coordination. When that Coordination is ended, the previous current Coordination is restored. Nesting is always on the same thread, implicit Coordinations are always associated with a single thread, available through its getThread() method. The end method must be called on the same thread as the begin(String,long) or last push() method. Using the standard model for implicit Coordinations, where the initiator always ends the Coordination on the same thread as it begun, ensures that nesting is properly handled. However, in certain cases it is necessary to manipulate the stack or make implicit Coordinations explicit or vice versa. For this reason, it is possible to pop Coordinations from the stack with the pop() method. This method disassociates the Coordination from the current thread and restores the previous (if any) Coordination as the current Thread. A Coordination can then be made the current Coordination for a thread by calling the push() method. However, a Coordination can be pushed on the stack at most once. If a Coordination is pushed a second time, in any thread, the ALREADY_PUSHED Coordination Exception must be thrown. The Coordination is removed from its stack when the end() method is called. It is therefore highly recommended to always end a Coordination in the nesting order. However, it is possible that a Coordination is ended that is not the current Coordination, it has nested Coordinations that were not properly ended. In that case all nested Coordinations must be ended in reverse creation order, that is, the current Coordination first, by calling the end method on it. When a Coordination is created it will receive a time-out. A time-out is a positive value or zero. A zero value indicates that the Coordination should have no time-out. This does not imply that a Coordination will never time-out, implementations are allowed to be configured with a limit to the maximum active time for a Coordination. Collaborators can extend the time out with the extendTimeout(long) method. If no time-out was set (0), this method will be ignored. Otherwise the given amount (which must be positive) is added to the existing deadline. A Coordinator implementation can fail the Coordination earlier, however, when configured to do so. If a Coordination is timed out, the Coordination is failed with a fail(TIMEOUT) method call from an unspecified thread, see Failing, TIMEOUT, ORPHANED, and RELEASED. The Coordination's life cycle is bound to the Coordinator service that created it. If the initiator's bundle ungets this service then the Coordinator must fail all the Coordinations created by this Coordinator by calling the fail(RELEASED) method. Participants from bundles that are stopped are not taken into account. This means that it is possible that a participant is called while its bundle is stopped. Stopped Participants should fail any Coordinations that they participate in. The Coordinator contains a number of convenience methods that can be used by collaborators to interact with the current Coordination. begin(String,long) - Is logically the same as create(String,long). push(). addParticipant(Participant) - This method makes it easy to react differently to the presence of a current implicit Coordination. If a current Coordination exists, the participant is added and true is returned (or an exception thrown if the Coordination is already terminated), otherwise false is returned. fail(Throwable) - If there is no current Coordination, this method returns false. Otherwise it returns the result of calling fail(Throwable) on the current Coordination. This method therefore only returns true when a current Coordination was actually terminated due to this call. The Coordination objects provide a number of methods that are used for administrating the Coordinations and the Coordinator. getBundle() - Provide the bundle that created the Coordination. This bundle is the bundle belonging to the Bundle Context used to get the Coordinator service. getFailure() - The Exception that caused this Coordination to fail or null. There are two fixed exception instances for a time out ( TIMEOUT ), when the Coordination is orphaned ( ORPHANED ), and when the Coordinator service is released ( RELEASED ). getId() - The Coordination's id. getName() - The name of the Coordination. getParticipants() - The current list of participants. This is a mutable snapshot of the added participants. Changing the snapshot has no effect on the Coordination. getThread() - Answer the thread associated with an implicit Coordination. If the Coordination is not implicit then the answer is null. getEnclosingCoordination() - Return the enclosing Coordination. getCoordination(long) - Retrieve a Coordination by its id. A Coordination can exist in three different states ACTIVE, END, and FAIL. During its life it will transition from ACTIVE to either END or FAIL. The entry (when the state is entered) and exit (when the state is left) actions when this transition takes place and the effect on the different methods are summarized in the following table. Notify all the participants by calling the ended(Coordination) method. Notify all the participants by calling the failed(Coordination) method. The value is the given name of the Coordination. Restricting the name of a Coordination allows the deployer to limit the use of this name to a restricted set of bundles. INITIATE - Required to initiate and control a Coordination. PARTICIPATE - Required to participate in a Coordination. ADMIN - Required to administrate a Coordinator. The target bundle of the Coordination Permission is the initiator's bundle. This is the bundle that got the Coordinator service to create the Coordination. An initiator must therefore have permission to create Coordinations for itself. CoordinationPermission(String,String) - The constructor for the granted permission. It is given a filter expression and the actions that the permission applies to. CoordinationPermission(String,Bundle,String) - The constructor for the requested permission. It is given the name of the permission, the bundle that created the corresponding coordination, and the requested actions. Coordination - A Coordination object is used to coordinate a number of independent Participants. CoordinationException - Unchecked exception which may be thrown by a Coordinator implementation. CoordinationPermission - A bundle's authority to create or use a Coordination. Coordinator - A Coordinator service coordinates activities between different parties. Participant - A Participant participates in a Coordination. participant The Participant to register with this Coordination. The participant must not be null. □ Register a Participant with this Coordination. Throws CoordinationException– If the Participant could not be registered with this Coordination. This exception should normally not be caught by the caller but allowed to be caught by the initiator of this Coordination. SecurityException– If the caller does not have CoordinationPermission[PARTICIPATE] for this Coordination. □ Terminate this Coordination normally. Throws CoordinationException– If this Coordination has failed, including timed out, or partially failed or this Coordination is on the thread local Coordination stack of another thread. SecurityException– If the caller does not have CoordinationPermission[INITIATE] for this Coordination. timeMillis The time in milliseconds to extend the current timeout. If the initial timeout was specified as 0, no extension must take place. A zero must have no effect. □ Extend the time out of this Coordination. Returns The new deadline in milliseconds. If the specified time is 0, the existing deadline is returned. If this Coordination was created with an initial timeout of 0, no timeout is set and 0 is returned. Throws CoordinationException– If this Coordination is terminated. IllegalArgumentException– If the specified time is negative. cause The failure cause. The failure cause must not be null. □ Terminate this Coordination as a failure with the specified failure cause. Returns true if this Coordination was active and was terminated by this method, otherwise false. Throws SecurityException– If the caller does not have CoordinationPermission[PARTICIPATE] for this Coordination. □ Returns the bundle that created this Coordination. This is the bundle that obtained the Coordinator service that was used to create this Coordination. Throws SecurityException– If the caller does not have CoordinationPermission[ADMIN] for this Coordination. □ Returns the Coordination enclosing this Coordination if this Coordination is on the thread local Coordination stack. Returns The Coordination enclosing this Coordination if this Coordination is on the thread local Coordination stack or null if this Coordination is not on the thread local Coordination stack or has no enclosing Coordination. □ Returns the failure cause of this Coordination. Returns The failure cause of this Coordination or null if this Coordination has not terminated as a failure. Throws SecurityException– If the caller does not have CoordinationPermission[INITIATE] for this Coordination. □ Returns the id assigned to this Coordination. The id is assigned by the Coordinator service which created this Coordination and is unique among all the Coordinations created by the Coordinator service and must not be reused as long as the Coordinator service remains registered. The id must be positive and monotonically increases for each Coordination created by the Coordinator service. □ Returns the name of this Coordination. The name is specified when this Coordination was created. □ Returns a snapshot of the Participants registered with this Coordination. Returns A snapshot of the Participants registered with this Coordination. If no Participants are registered with this Coordination, the returned list will be empty. The list is ordered in the order the Participants were registered. The returned list is the property of the caller and can be modified by the caller. □ Returns the thread in whose thread local Coordination stack this Coordination has been pushed. Returns The thread in whose thread local Coordination stack this Coordination has been pushed or null if this Coordination is not in any thread local Coordination stack. □ Returns the variable map associated with this Coordination. Each Coordination has a map that can be used for communicating between different Participants. The key of the map is a class, allowing for private data to be stored in the map by using implementation classes or shared data by using shared interfaces. The returned map is not synchronized. Users of the map must synchronize on the Map object while making changes. Throws SecurityException– If the caller does not have CoordinationPermission[PARTICIPANT] for this Coordination. □ Returns whether this Coordination is terminated. Returns true if this Coordination is terminated, otherwise false if this Coordination is active. timeMillis Maximum time in milliseconds to wait. Specifying a time of 0 will wait until this Coordination is terminated. □ Wait until this Coordination is terminated and all registered Participants have been notified. Throws InterruptedException– If the wait is interrupted. □ Push this Coordination object onto the thread local Coordination stack to make it the current Coordination. Throws CoordinationException– If this Coordination is already on the any thread's thread local Coordination stack or this Coordination is terminated. The Coordination has terminated as a failure with Coordination.fail(Throwable). When this exception type is used, the getCause() method must return a non-null value. message The detail message for this exception. coordination The Coordination associated with this exception. cause The cause associated with this exception. type The type of this exception. □ Create a new Coordination Exception with a cause. Throws IllegalArgumentException– If the specified type is FAILED and the specified cause is null. □ Create a new Coordination Exception. Throws IllegalArgumentException– If the specified type is FAILED . □ Returns the id of the Coordination associated with this exception. Returns The id of the Coordination associated with this exception or -1 if no Coordination is associated with this exception. □ Returns the name of the Coordination associated with this exception. Returns The name of the Coordination associated with this exception or "<>" if no Coordination is associated with this exception. □ Returns the type for this exception. Returns The type of this exception. 130.5.4.1 public static final String ADMIN = "admin"
130.5.4.2 public static final String INITIATE = "initiate"
130.5.4.3 public static final String PARTICIPATE = "participate"
filter A filter expression. Filter attribute names are processed in a case sensitive manner. A special value of "*" can be used to match all coordinations. actions admin, initiate or participate (canonical order). □ Creates a new granted CoordinationPermission object. This constructor must only be used to create a permission that is going to be checked. Throws IllegalArgumentException– If the filter has an invalid syntax. coordinationName The name of the requested Coordination. coordinationBundle The bundle which created the requested Coordination. □ Creates a new requested CoordinationPermission object to be used by the code that must perform checkPermission. CoordinationPermission objects created with this constructor cannot be added to an CoordinationPermission permission collection. obj The object to test for equality with this CoordinationPermission object. □ Determines the equality of two CoordinationPermission objects. This method checks that specified permission has the same name and CoordinationPermission actions as this CoordinationPermission object. Returns true if obj is a CoordinationPermission, and has the same name and actions as this CoordinationPermission object; false otherwise. □ Returns the canonical string representation of the CoordinationPermission actions. Returns Canonical string representation of the CoordinationPermission actions. □ Returns a new PermissionCollection object suitable for storing CoordinationPermission objects. participant The Participant to register with the current Coordination. The participant must not be null. □ Register a Participant with the current Coordination. Returns false if there was no current Coordination, otherwise returns true. Throws CoordinationException– If the Participant could not be registered with the current Coordination. This exception should normally not be caught by the caller but allowed to be caught by the initiator of this Coordination. SecurityException– If the caller does not have CoordinationPermission[PARTICIPATE] for the current Coordination. name The name of this coordination. The name does not have to be unique but must follow the symbolic-name syntax from the Core specification. timeMillis Timeout in milliseconds. A value of 0 means no timeout is required. If the Coordination is not terminated within the timeout, the Coordinator service will fail the Coordination with a TIMEOUT exception. □ Create a new Coordination and make it the current Coordination. Throws IllegalArgumentException– If the specified name does not follow the symbolic-name syntax or the specified time is negative. SecurityException– If the caller does not have CoordinationPermission[INITIATE] for the specified name and creating bundle. □ Create a new Coordination. Returns The new Coordination object. cause The failure cause. The failure cause must not be null . □ Terminate the current Coordination as a failure with the specified failure cause. Returns false if there was no current Coordination, otherwise returns the result from calling Coordination.fail(Throwable) on the current Coordination. Throws SecurityException– If the caller does not have CoordinationPermission[PARTICIPATE] for the current Coordination. id The id of the requested Coordination. □ Returns the Coordination with the specified id. Returns A Coordination having with specified id or null if no Coordination with the specified id exists, the Coordination with the specified id is terminated or the caller does not have CoordinationPermission[ADMIN] for the Coordination with the specified id. □ Returns a snapshot of all active Coordinations. Returns A snapshot of all active Coordinations. If there are no active Coordinations, the returned list will be empty. The returned collection is the property of the caller and can be modified by the caller. □ Returns the current Coordination. Returns The current Coordination or null if the thread local Coordination stack is empty. □ Remove the current Coordination from the thread local Coordination stack. Returns The Coordination that was the current Coordination or null if the thread local Coordination stack is empty. Throws SecurityException– If the caller does not have CoordinationPermission[INITIATE] for the current Coordination. coordination The Coordination that has terminated normally. □ Notification that a Coordination has terminated normally. Throws Exception– If this Participant throws an exception, the Coordinator service should log the exception. The Coordination.end() method which is notifying this Participant must continue notification of other registered Participants. When this is completed, the Coordination.end() method must throw a CoordinationException of type CoordinationException.PARTIALLY_ENDED. coordination The Coordination that has terminated as a failure. □ Notification that a Coordination has terminated as a failure. Throws Exception– If this Participant throws an exception, the Coordinator service should log the exception. The Coordination.fail(Throwable) method which is notifying this Participant must continue notification of other registered Participants.